I have been conducting a five-month experiment on ten gallons of cider. Actually, I've been implementing the experiment under the guidance of the study's principal investigator (and the orchardist who supplied the juice), Kevin Zielinski. Back in January, Kevin dropped off two five-gallon carboys full of freshly-pressed juice. 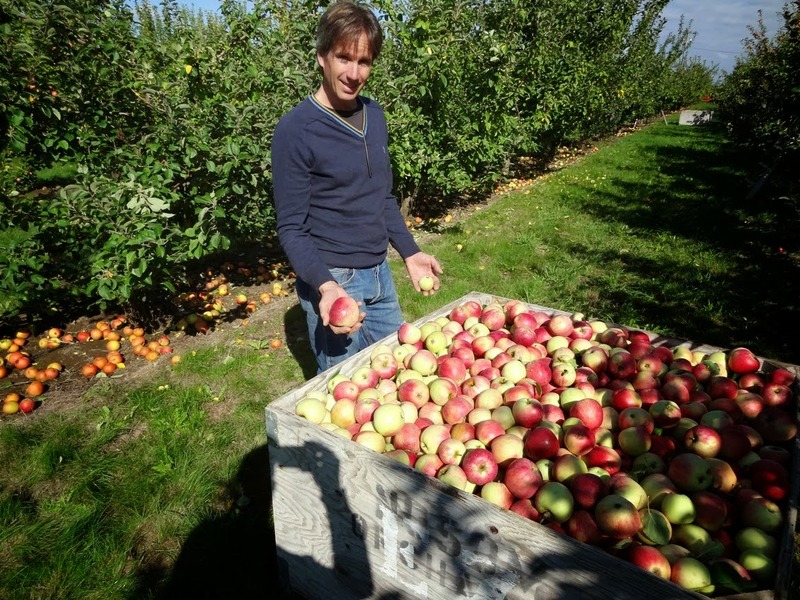 It's the same juice that goes into his EZ Orchards Cidre, a product regulary cited as some of the country's best (so yes, the good stuff). Kevin had seen my earlier experiment with natural fermentation, and he thought I would benefit from a side-by-side trial. The experiment: see the effect racking has on natural fermentation. Cider will ferment itself, a lot easier and with less worry than most people imagine. (I've spoken with cider-makers who fret about acid levels and the dangers of wild microorganisms. Acid is a natural defense against infection, and many cider makers, even the ones who pitch their yeast, feel that cider above a pH of 3.6 or 3.8--the number varies--will go wrong. I discovered that cider makers in Europe, including those in France and England who regularly have cider above those levels, don't worry about infections at all. And Kevin doesn't, either.) If you let it sit in the carboy in cold conditions--I kept mine below 55 degrees--natural yeast will ferment all the sugar out of the juice. All you really have to do is keep it cold. Now, interestingly, if you want to keep the juice from fermenting all the way out, you can actually retard fermentation by starving the yeast. One method is keeving, which is a convoluted method of removing nutrients from the juice before fermentation. The other method is racking, or transferring the juice. When you do this, you manage to leave a lot of yeast behind (it slowly settles into a cake as it ferments). In the new carboy, the left over cells, those that are still active, try to rouse themselves to eat all that tasty fructose floating around. They bud and divide and create a new population. This both removes oxygen from the juice (a generally good thing) and also some of the nutrients. This is key because eventually the yeast eats all the nutrients that keep it going. They'd probably love to keep eating, but they run out gas. This is how the French are able to have very sweet ciders that are stable in the bottle. After checking the March gravity, I decided to rack Carboy 2, the laggard, once more. It was already going slow, so I figured I'd slow it down even more and let the other one run. That's all it took. After that, carboy 2 didn't need to be racked again and just naturally slowed down. Here's how they proceeded. Both ciders are sweet and fresh, with not a hint of anything wrong. The tannins are still pretty rough, but smoother than they were in April. I expect they'll continue to soften as the magic of biochemistry continues. So there you go: the simple effect of racking on juice. I expect the cider to be spectacular, but of course, it's the orchardist who gets all the credit. All I did was store his carboys.